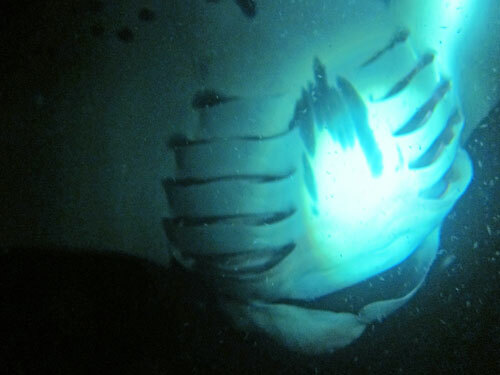 Exceptional Hawaii Manta Ray Snorkel Experience - At Night! Our Hawaii Manta Ray snorkel was truly a sublime experience, one of the most amazing snorkeling adventures we have ever had. We got on the boat at dusk, and motored out to sea, arriving after dark. Our destination was just off shore from the airport north of Kona on the Big Island of Hawaii. 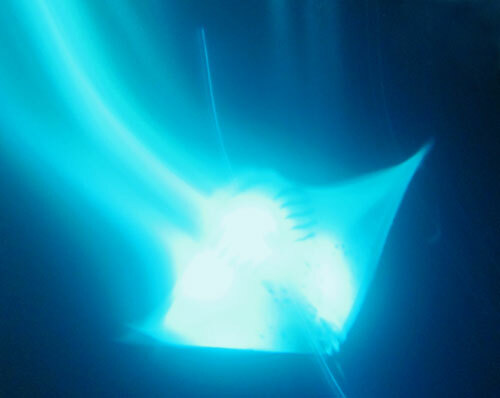 Our Hawaii Manta Ray snorkel starts in a surreal fashion and just keeps getting more and more other worldly. Once we had reached our destination our guides strapped colored glow sticks to our snorkels so that we could find each other in the dark on the water. Each different boating company has their own color, so we could easily keep track of our own group. There was at least a dozen boats. Swimming in the dark, in open ocean, with a hundred people with glow sticks on their snorkels was a completely unique experience all by itself. When do you ever see that? As a group we swam a short ways away from the boat, until we found a big ring of very bright lights on the ocean floor, shining up into our eyes. Our guides also each had powerful hand held lights. And there was also about fifty divers on the sea bottom, all with handheld lights. Already this is really starting to feel like an alien experience. And then it happens. I see a movement coming out of the dark. And a huge winged creature suddenly flies up out of the depths right toward us and then starts to turn big circles in front of my face, getting as close as a foot away. That got my heart pounding. It was a little unnerving, but quickly became a moment of awe. Then several more Mantas joined us. Their underbellies are bright white, reflecting the lights. I heard loud oohs and ahhs and giddy laughter coming out of the snorkels around me. Then as I looked down, my mind started to really lose it's grip on reality. Everywhere I looked, in every light, there were dozens of these huge graceful creatures turning circles. There was so much new and foreign in this entire experience that my mind went kind of numb and quiet, and I found myself just staring. We were very fortunate on our Hawaii Manta Ray snorkel. 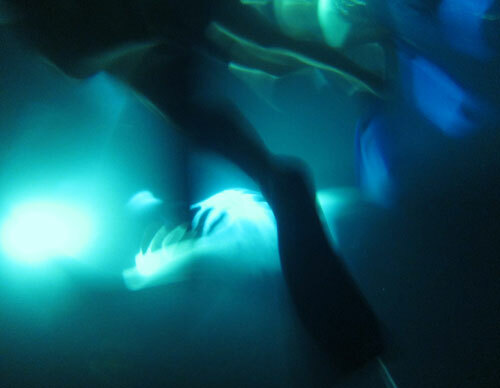 On this particular night there was over thirty individual Mantas counted, a record number. There were a number of the bigger females that had wing spans about 16 feet across, several of which that were pregnant. And there were many more of the smaller males that had wing spans from 8 to 10 feet. The biologists/naturalists that go out with these boats are fanatics. 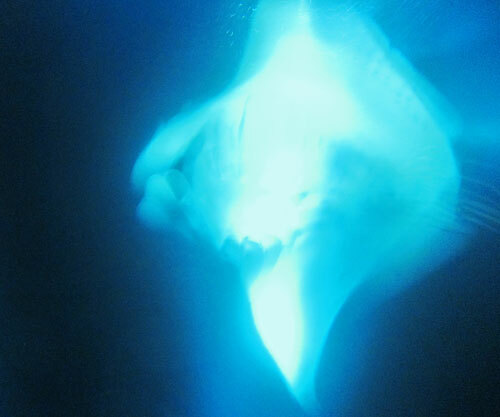 They appear genuinely excited for each encounter, and have names for most of the Mantas. They were very excited by the presence of the pregnant females. We are told that the babies are born like burritos, with their wings wrapped around them in a cocoon. 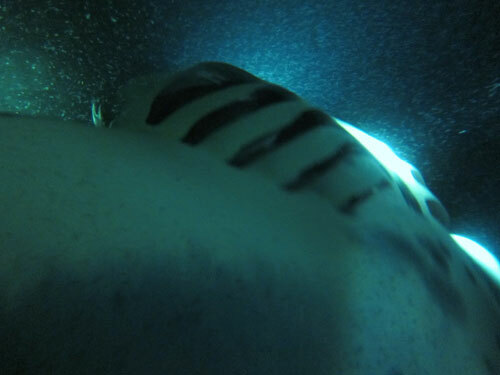 The Manta Rays visit this spot to feed on plankton. And the plankton is attracted to the light. 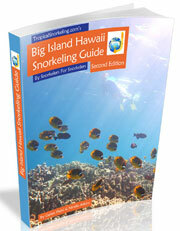 In the Hawaii Manta Ray snorkel video below, you will see lots of white specks in the water. That is the plankton. When we first got in the water, it was thick with plankton. But by an hour later, there was a noticeable reduction. 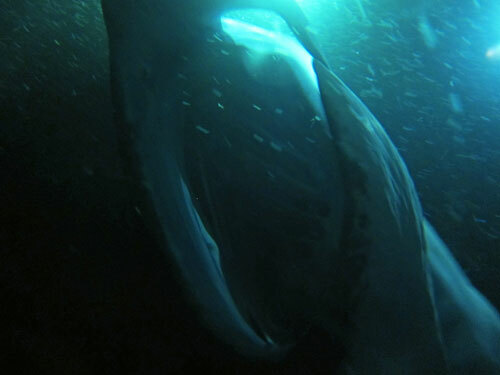 The Manta Rays were feeding heavily. You may wish to turn up your speakers. While the videos I got came out pretty good, the pictures I got were terrible. I may have had a camera setting wrong, or there just was not enough light. I was truthfully too distracted to figure it out. Somehow the few pictures I did get manage to convey how eerie but beautiful the experience was. Fantastic! Don't miss a Hawaii Manta Ray snorkel if you have the chance.